Am working on e reader covers to sell. In these pics I'm only up to the first turn right side out stage. Because of a back injury, I find it easier to chain piece the non quilt items then recline on the bed when I need to turn them. Aside from the books you see in the one pic (I'm a voracious reader & usually read at least 3 or 4 at the same time), the whole rest of the bed was empty. There also wasn't a furry face in sight when I set the pieces down on the end of the bed. A 20 sec turn of back and voila! I have said before, Patch can hear fabric hit the bed from another room. She is beautiful! How nice that you share a love of fabric, though your taste in food might differ a bit. he, he. She just wants to help mama!! I know exactly what you mean! I swear that Chester (my avatar) can hear my eyes open in the morning. And I think he reads minds too. If it is a morning that I am planning on sleeping in a bit, he'll be quiet. But otherwise, he will start meowing as soon as those eyelids get raised. BTW your Patch is a handsome hairball. I'm sure he just wants to help or maybe supervise! Gorgeous cat. I love calicoes. Patch is beautiful! I love her coloring! Such a precious little face! Oh my, she is SO pretty!! Patch is darling! How nice that you have a sewing buddy! Miss my two black kitties tremendously, but sure enjoy seeing your fur baby! :-) She's sweet looking. GingerK, my dtr and 2 grands at one time had a cat named Chester. He walked with a limp! 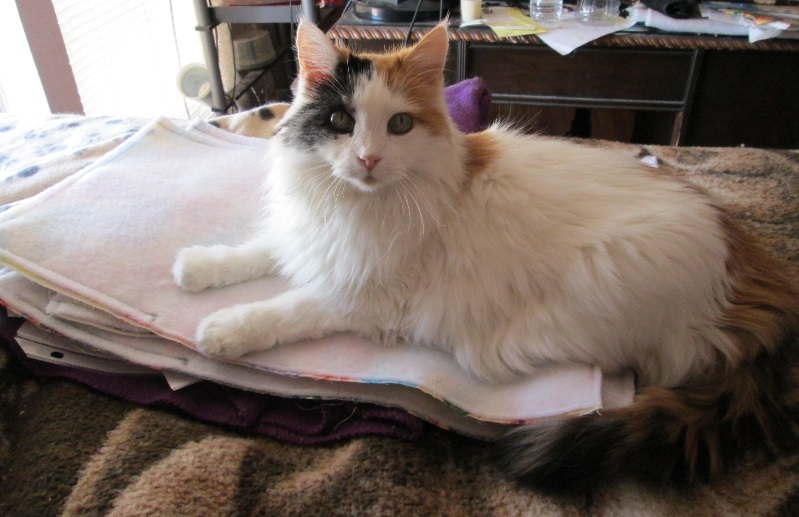 I have a kitty that I got from a rescue, and she is a Turkish Van (try google, you will be amazed). They are an anomaly , and occur randomly...tho they are called a breed. They are white and the "cap" and tail markings are a huge factor (they can be black, grey or "red" but I haven't seen a calico), and have extra soft fur (like rabbit fur) because they have no coarse hairs in their coat and their love of water are factors as well. Some have a spot on their back between their shoulder blades called "the thumb print of God" and mine has it. They are sooo loveable. I think Patch might be one! What a beautiful baby. 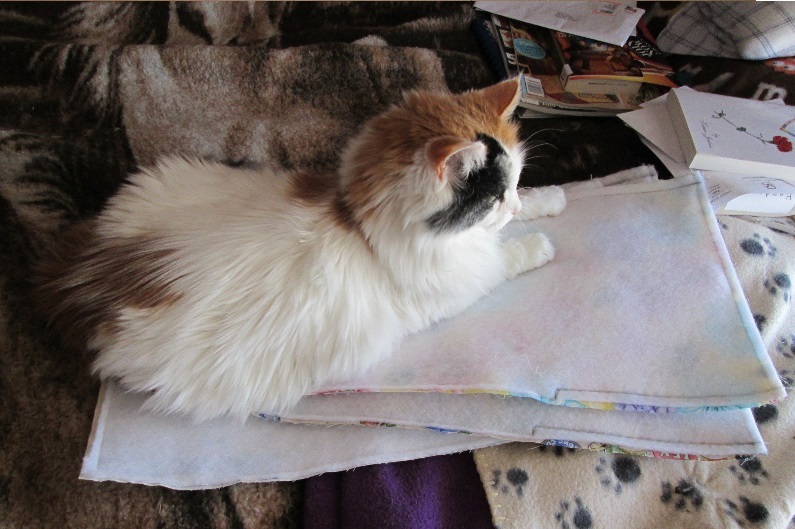 When I had kittys they had to be right on the fabric while I was working on a quilt. LOL. What an adorable kitty! Thanks for sharing pics. I'm a dog person, but that is one beautiful cat! That is such a beautiful kitty. Cats are wonderful. Pretty cat. She has such a sweet face. First, I have to say that Patch is absolutely beautiful. I love calicoes. I agree, some cats can hear fabrics hit a surface they can sit on. My "TJ" loves to walk across my quilting projects to get to the window, only to walk back to sit on my portable ironing board. It's like a routine with her. What a cute face! How can you not let Patch do what he wants to do! She who dies with the most fabric didn't sew fast enough! Oh, wow - she is absolutely beautiful. That is one more pretty cat in this great world of pretty cats--there are no ugly ones in my book.....but she is a real beauty.